We're going to be seeing a whole lot of Steam Box models over the next several months, I suspect, and here's another option to be considered. 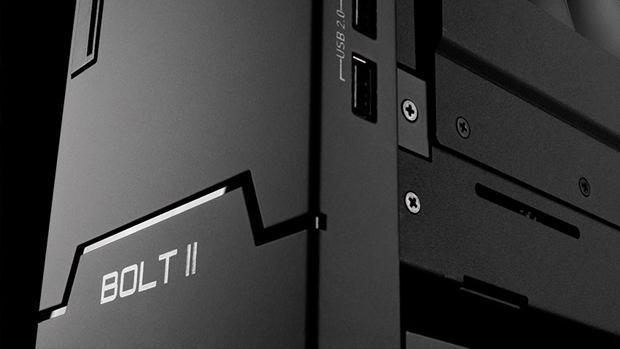 Digital Storm has announced today the Bolt II gaming PC, which will sport both Steam OS and Windows 8 out of the box to offer a versatile device which should be able to play just about anything you throw at it. The slim (less than 4.5" wide) tower keeps temperatures low with a liquid cooling system for the CPU and an airflow design featuring more vents than a viewing of Die Hard. You'll pay for the premium, though. The Bolt II will be initially offered in four configurations starting at $1,899. Pre-orders begin later this month.